If you decided which acoustic products to use in your home studio, it’s time to place them in the room. Although this may seem easy, in reality it’s more difficult than you think, because there are many factors to be taken into consideration when you treat a room. Usually, the control room is used to monitor the recordings and mix the songs. If your home studio allows you to have a control room and a booth, this means you really need to insulate to control room as better as you can. When you start insulating the control room, the first place to start is the area behind the monitors (speakers). The actual control area (the computer, the monitors) is the most important, because this is the area where the early reflections will be coming from. The early reflections are the reflected speaker sounds that come from the wall behind. So, the reflection will be perceived by your ear by the same time you will perceive the sounds coming from the speakers, causing cancellation and filtering effect. If you don’t have a glass window behind the speakers (like in the picture above), you can place the first acoustic panel right between the monitors, in the center. If you can’t use that area, you can use two panels and place them as seen in the picture above, behind every monitor. Next, we need to handle that bass reflection. The best way to place the bass trapping panels is the upper corners of the room, because the low frequencies tend to congregate there. This will not waste floor space, and that’s also important if you’re using a tight space. If you have enough bass panels, use them for every corner of the room. The next places to add the acoustic foam are the sidewalls. You don’t want to place them to low or too high, because they must be placed at the ear level, one or two feet above the floor (that kind of placement will give you the best results). Remember to allow some space between the panels, 4-5 inches will do just fine. This will give you a nice design, but it will also increase the amount of absorption of the sidewall. Although it’s not used that often in home studio projects, the diffusion panels are also pretty important if you plan to treat a room properly. Usually, they are placed on the back wall, behind the mix position. Again, you don’t want to place them too high or too low. 2 feet above the floor is recommended. If you’re using a small room, you can use normal acoustic foam instead of the diffusers. The recording booth is used to capture vocals. In order to have a proper recording, you need to capture dry vocals, without any type of reverberation and echoes. You can add those later at levels that fits your project, in the mixing session. In home recording studios, the recording booth is usually small and it’s pretty difficult to have a proper acoustic treatment for it. 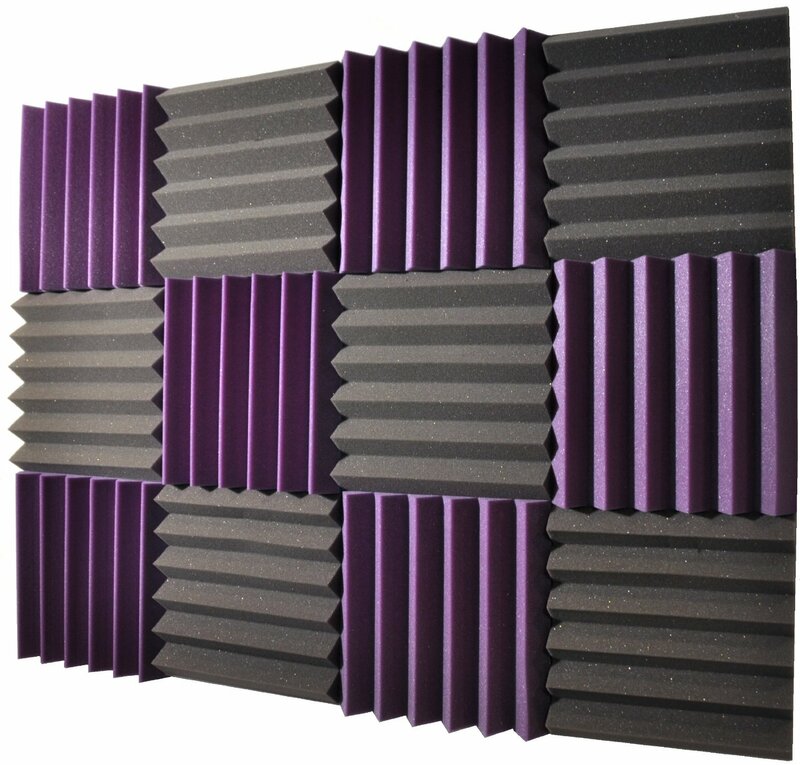 The best treatment for recording booth is over 50% acoustic foam coverage in order to remove all the sound reflections. Remember that a small room produces more bass, so you will be needing some sort of bass trapping. But placing corner traps in small rooms can be a real issue. That’s why I really think it’s tricky to treat a small recording booth, because it needs a lot of mass and insulation it its walls and door. For one-room home studio, the recording booth can very well be placed in the control room. This means you need to cut as much ambient noise (computer fans, recording equipment, surrounding) as you can. You can use a standard microphone isolation panel and place it between the mic and the recording equipment, in the back of the room, as far away from the recording equipment as possible. 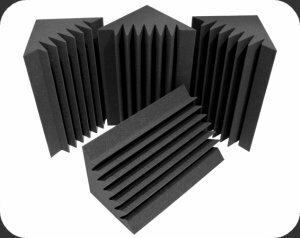 Check the best acoustic foam products. Insulating a home recording studio requires a careful analysis of the building in which the apartment is placed, and choosing an appropriate foaming system. This can be done by a specialized team, but I guess you are on a tight budget and you will skip this step. There are many online shops that will provide some of the best acoustic foam products at reasonable prices. All you have to do is read the reviews, compare the prices and decide for what’s better for you. Remember, a bigger price does not necessarily mean great quality. Read the reviews! 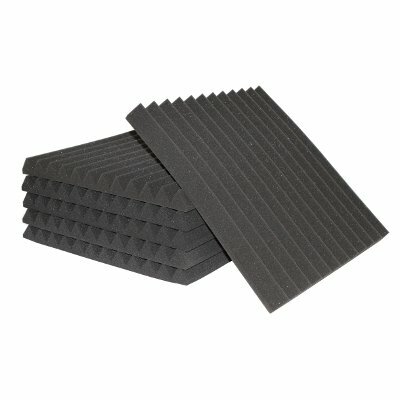 I have gathered few acoustic foam options that are suited for a home studio, starting with the cheapest and simplest one. This is the cheapest and simplest acoustic foam you can buy, and one piece of this has the following dimensions: 1/2″ x 12″ x 12″. The pack contains 2 pieces. They can be used on the sidewalls, the wall behind the control desk and in the recording booth. ATS Wedge produces acoustic panels with dimensions of 24″ x 24″ x 2″. The square panel is 2 inches thick and one package contains six panels. Reading the reviews, I found out that one user manage to reduce the sounds coming from his basement by half using just the six pieces from the package. This acoustic foam looks stylish and modern, so you can also use it in your room without messing to much with the room’s design. Contrary, you will add a futuristic flavor to the room. It can be glued with 3M double sided tape. It comes in two colors, charcoal and burgundy, so you can choose the one that better fits the color of your control room or recording booth. SoundTrax has designed a special type of acoustic foam, the SoundTrax PRO Studio Acoustic Foam. 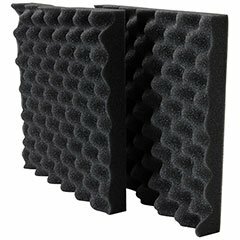 The size of this acoustic foam is 24″ x 12″ x 2″, and it offers great performance at low price. 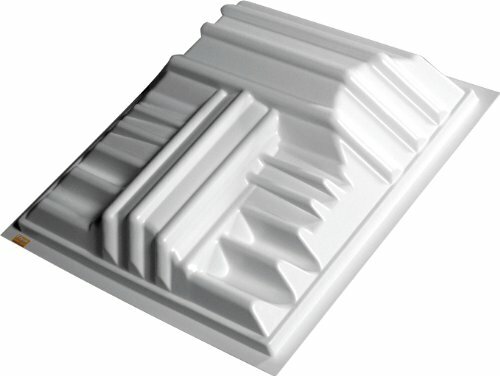 Its unique design absorbs sounds especially on mid and high frequency range, so they work great on sidewalls and front wall. If the room is small enough, they can be also placed on the back wall, instead of diffusers. The package contains 12 panels (6-nested pair). If we are talking about design, this Soundproofing Studio Foam is the mother of all foams. The package (as seen in the image) contains 12 pieces and covers around 12 square feet. You can use it in small and medium sized rooms and works great for boots and control/mixing rooms. If you want to insulate all frequency bandwidth, you will also need to buy corner bass absorbers. As I said, getting the best acoustic foam panel is not enough for your home studio project, because they will absorb only mid and high frequencies. If you want to insulate the full sound frequency spectrum, you should also get Bass Trap/Absorber. The package from the image above contains 8 durable pieces, each with 12″x12″x24″ dimensions, just enough to use them on the four corners of the room. If the bass in the room is too powerful, you should use all 8 bass corners, in pairs of two. My honest opinion is that the diffusers can be skipped if you are on a tight budget. They have an important purpose in large rooms, but if you have a small room you can use normal acoustic foam instead. They are mounted on the back wall, right in the absolute center. Usually, you only need two pieces. The diffuser in the image is called T’Fusor and it’s made from lightweight sturdy material. Although it is white, it can be paint in order to fit the room color. In order to place the acoustic foam products, you need some type of glue. 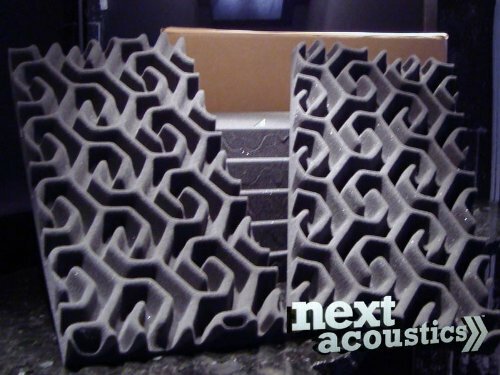 Auralex have developed Ftspray Foamtak, a glue that allows you to mount up to 96 square feet of acoustic foam per tube. As an alternative, you can use wooden strips or other 3m adhesive spray. Whether you use it for insulating an apartment or a home recording studio, an acoustic/sound foam is always needed. The market has some interesting solutions in this regard, and we will get into that subject in this article. Using a form of acoustic foam is indicated when you want to capture clear sounds when you’re recording vocals on the microphone. Also, acoustic foam usage is indicated when you do not want to disturb the neighbors (if you have any). These soundproofing materials allow sound waves to be absorbed into the foam, not allowing them to pass. At a thickness of 5 cm, acoustic foam insulates 8 times better than wool, both in terms of acoustic and thermally. Acoustic foam materials are glued to the wall and ceiling in the recording room, and they filter sound coming to or from the neighbors. More than that, it reduces the reverberation in the room, allowing you to record and listen at maximum quality. Insulating the recording boot is a must, in that way the microphone will capture only the vocals, without the additional room reverberation. Check some of the best acoustic foam solutions and read how to place the acoustic foam in the control room and in the recording booth.